My buddy Mason from Aisha Garage sent over this scan from the latest Drift Tengoku magazine. It’s the recent issue that shows the station wagon drifting on the cover. 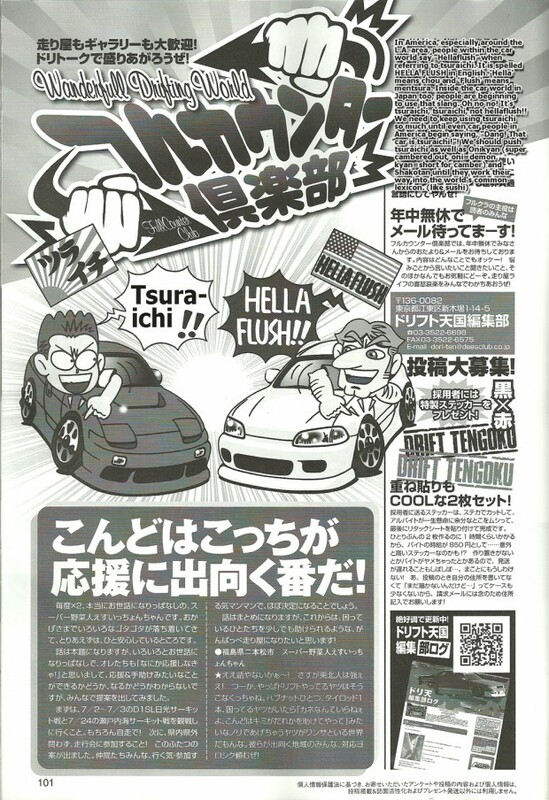 This small article has some information on Hella Flush in USA and what they refer to the same style in Japan called “Tsuraichi”. Thanks again Mason for the scan and be sure to check out his site, selling many imported 2nd hand AUTHENTIC Japan parts located in the Bay Area! Dang that car is Tsuraichi! I just noticed the white USDM guy with the big nose… haha! Tsuraichi has been around since the late 70’s and 80’s. They have been slamming cars with over fenders and tires stretched over rims since then. It was to mimic the silhouette category 5 series when Skyline Hakosukas and other Japanese cars were dominating races. The cartoon with the “American” with the big nose is stereotypical for Japanese. I am stuck with the total irony of being Half Japanese and half American. There is even more irony by being born and raised in Japan 95% of my life but I am a American. Just stuck between two cultures and seeing both views.